Lately I’ve had a hankering to do some deep food exploration in Westchester. It has now been nearly a year since I wrote up the report for Westchester Magazine’s “Eater” blog about the State of the Taco in White Plains. Feeling the itch to go much deeper in the exploration, I’ve decided to take it on myself to try every empanada humanly possible in Westchester County to find where – or if – greatness exists in the realm of the wonderful Latin American turnover. As usual, I started this quest with a query to Chowhound. Based on some previous notes, and some of the suggestions coming from that thread, these are the places currently on my target list. I know there are more places with empanadas in Westchester County (afterall, pretty much every Latin restaurant of any kind has them), but these are the ones I’m focusing on right now. Sadly, I’m less than half way through the list. In the past three weeks, I’ve tried Panaderia Uruguaya, La Nueva Puebla, Inca y Gaucho, Los Andes Bakery and Med. I won’t go into specific notes, but here are a few observations. There is simply no replacing empanadas that are cooked on site. And based on my recent excursions and prior visits, only about 1/4 of the restaurants around here actually make their empanadas on site. Quality suffers dramatically as a result. Also, I’ve noticed a distinction within this phenomenon. In general, fried empanadas are made on site, while baked empanadas are cooked somewhere else. As a result, the baked empanadas are really coming up short. That’s too bad, because a great baked empanada is one of the best treats in life. I also tried Med and it is deliciuos and they have good meal deals and the best they deliver. Los Andes Bakery empanadas eaten right from their ovens are not to be missed. The aromas and taste are a treat to the senses. Bring quarters to pay for the parking meters. You will want to take your time with these and the local police are quick with the tickets. Los Andes Bakery is well-known all over Westchester for their empanadas. Never heard of Med, but Los Andes was once featured on the cover of Sam’s Magazine for their delicious products. I am a fan of empanadas and had alot of them in my last trip to Argentina.. 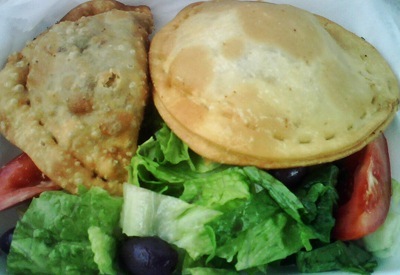 I tried MED EMPANADAS in Briarcliff…. I can only say ” THE BEST” ………………………. You haven’t gone to Pablos Deli in Dobbs Ferry yet? what r u waiting for..authentic, freshly prepared, and baked on premises, and oh, so delicious. He also has amazing Chilean sandwiches to die for. Not to be missed!